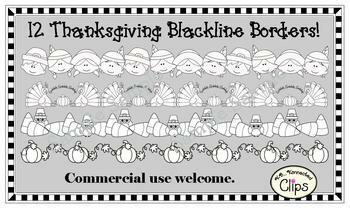 12 cute Thanksgiving blackline borders for your products/classroom creations. There's a freebie from the collection in the preview! Although these are not exactly the same as my Thanksgiving (color) Page Dividers/Borders they certainly compliment them. They also will go great with my Thanksgiving Mix and Match Collection. 40 Blackline Borders/Page Dividers - 2 freebies in preview! 12 Thanksgiving Page Dividers/Borders (blackline) by Kb...Konnected is licensed under a Creative Commons Attribution-NoDerivs 3.0 Unported License.